Inside CPA firms we do a lot of talking about mentoring but often we demonstrate very little action. When I ask participants in my presentations if they have a mentoring program most of them say, “Yes”. However, when I ask how these programs are working I usually get “So-so” as an answer. There seems to be some confusion about the difference between mentoring and coaching. If you Google these words you will get a lot of differing opinions on what they mean and how to go about being a mentor or a coach in the business world. I will add my voice to the masses and tell you how I think it plays out inside a successful CPA firm. I believe that a mentor is a listener, a sounding board, a wise resource to guide and steer you as your evolve, develop and gain experience in your career. In a CPA firm both roles are needed. 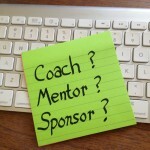 I like to see mentoring programs have a foundation of coaching. The first year or so, beginners really need a coach (or buddy), someone who knows how to actually do the work, use the software, etc. and then they evolve to where they need more of a mentoring situation (and this usually is a different person) who is more of a career counselor. As with everything, mentoring is under-going some changes in the professional service firm world. If a mentor and a coach aren’t enough, we are now reading and hearing more and more about having a “Sponsor” as your develop your career. Honestly, I think that what we have inside CPA firms is really more of a sponsor relationship. It is more of an “I will help you and in return you will help me” type of relationship. A Sponsor builds a relationship with people (by helping them succeed) and they give back to the sponsor by helping them (and replacing them) so they can go on to bigger and better things. It’s like succession – – – I will teach you, train you and promote you and you will help me handle my clients and responsibilities better and eventually replace me. Read this entire article (it’s short) and you’ll see what I mean.